Are you laughing? Or crying? Either way, you’re not alone: most marketers DON’T know! I can confidently say that because, for the past 9 years, my team and I at DemandGen have heard almost every one of our clients express frustration over the challenge of showing Marketing’s contribution to pipeline and revenue. It’s much more than just a challenge, of course; it’s one of the primary reasons that historically Marketing has been viewed as a cost center — and has been treated like one, at annual budget times or whenever profitability targets aren’t hit. In this age of modern marketing, you’re surely aware that Marketing possesses the technical ability to measure marketing effectiveness. So why do so many companies still struggle with it today? For years we have been helping our clients to address those first two challenges by educating them on metrics and reporting, as well as researching and implementing technologies and processes to capture the data they need. But that third bullet point was still a problem: many clients still couldn’t get accurate attribution of revenue to marketing campaigns. When they needed us to help them figure out why, the answer was invariably, “Salesforce isn’t natively designed to do attribution well, and is also too dependent on your sales team to associate contacts to opportunities.” Gaps between systems, limitations of the Salesforce attribution model, dependencies on user behavior, and insufficient reporting triggers all contribute to the problem. DemandGen CAA enables Marketing teams to get proper campaign attribution (filling gaps left by the CRM) by calculating multiple attribution models (not possible in most CRM/MA systems), and providing reports for analyzing campaign performance and impact to both pipeline AND bookings (both deals in pipeline and closed/won deals). Why Aren’t CRM and MA Enough? Let’s back up a second and look at why you need a CAA solution. Even if you have marketing automation, a CRM system, and integration with your website (and high-level technical expertise in each of those), that is not sufficient to do campaign attribution. Why not? Essentially, the way in which Salesforce and other CRM systems are designed to operate creates workflow and data issues impacting the ability to accurately attribute revenue. Manual processes introduce error. In the CRM, campaign attribution is very heavily dependent on sales reps using the system properly in order to carry attribution data through the entire workflow from lead to close. 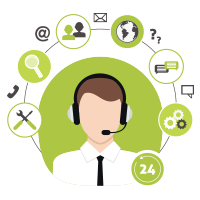 Out of the box, it’s possible for a CRM sales user to create a new opportunity and associate practically nothing with it – and you don’t want that. If you diligently train every sales rep to follow a defined and documented process, you’re going to get less than 10% consistent adoption based on our experience – that’s 1 in 10 reps at best. And even if you have the perfect sales reps in the world, who invariably assign a contact to every opportunity they create, you’d still only have those contacts’ campaigns associated with those opportunities. You’d still be missing all the other contacts involved in each opportunity, and you wouldn’t be able to attribute those opportunities any campaigns. As a result, campaign attribution accuracy is lost – and you can’t fill that gap with a documented process or training. Why? Because Salesforce only has one attribution model, and in B2B marketing, there is rarely if ever just one contact (buyer) in the buying process. We need to attribute all contacts at the account involved in the opportunity. Account-based marketing complicates attribution. In account-based marketing, which is all the rage right now, rarely is there a single point of contact in a deal, as I mentioned. You are always marketing to a buying committee including the user, the influencer, the decision-maker, and others, who each may respond to different campaigns. If a user, for example, becomes associated with the opportunity because that person responded to more emails, the revenue would ultimately be attributed to one of the campaigns that person received – but what about those other people who also responded to other campaigns? They aren’t associated with the opportunity at all, even though one of them is actually the decision maker, and others influenced the purchase decision due to your marketing efforts. That brings us to the next issue. . .
Salesforce doesn’t support multiple attribution models out of the box. If you ask ten people how to attribute revenue in account-based marketing, you’ll get ten different answers. By role? “The decision-maker, because she would actually do the purchase.” “The user, because he was interested first and influenced the decision-maker.” By timing? “The first touch that puts them into a nurture,” “The last touch because that was the trigger to buy.” Everyone has a different opinion, but most systems force you to a specific model. Again, unacceptable. Here’s an example that demonstrates why you must support multiple attribution models. Let’s say at a recent conference you had some interactions with Company X: some people visited your booth, and some of those people registered for a party you hosted, and a few met with you. Ultimately they made a purchase. If you can only choose one place to attribute that revenue, what would it be: the conference as a whole? The booth? The party? The suite meeting? The post-show campaign? The follow-up call from Telesales? The truth is that all interactions can be relevant to any revenue that we may generate from those contacts; it really depends on the circumstances. But when you can’t adapt your attribution methodology to the circumstances, you’re kind of stuck. Most CRM systems like Salesforce don’t include the ability to natively handle attribution across multiple models. Ultimately, that means your campaign attribution reports are inaccurate and insufficient because so many campaigns are left out of the attribution mix. Campaign IDs aren’t always consistent. Another key issue has to do with how campaign IDs are established and captured from campaigns in the marketing automation system. Marketo and Eloqua, two of the most popular B2B systems, leave it to the system users to determine how to associate campaigns with contact records and accounts. If someone downloads a document from your website, what campaign should it be associated with? Should the piece of content be its own campaign, or should the lead be tied to the website resources campaign ID, or assigned to the email that drove the person to the website? Who decides: the web person, the content creator, the email creator? If I send an email that says “come to our party at this conference,” is that an email campaign ID or a conference campaign ID? What about nurture campaigns — are leads who participate attributed to the nurture campaign too, or just the campaign that brought them into the nurture? There’s a lot to think about, and a lot of configuration required to ensure a consistent approach across all your campaigns. Take a breath and relax, as we’ve solved all these challenges for you at a strategic and systems design level with CAA. Yes, campaign attribution assignment and analysis is challenging. It’s hard to measure even if you have the right tools because the existing tools frankly don’t do it right. That’s why we created the CAA solution. CAA is essentially an add-on for Salesforce. You won’t find it in the Salesforce AppExchange as it’s only available to DemandGen clients. We typically install CAA for our clients in their Salesforce instances, but clients can also choose to do it themselves. After installation, the configuration is fast and easy. You simply decide how many days to allow for the campaign attribution window leading up to opportunity creation, and assign first and last touch weighting for spread models. This example shows 180 days and 40% for first and last touch. 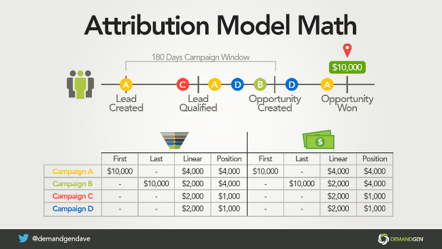 Select as many attribution models as you want. This way you’re not forced to a first touch, last touch, or spread model. CAA lets you see all the attribution models so you can see the impact of every campaign you’re running, from top-of-funnel lead generation programs to mid-funnel nurture campaigns to “closer campaigns” that offer discounts or free trials. Auto-calculate attribution. 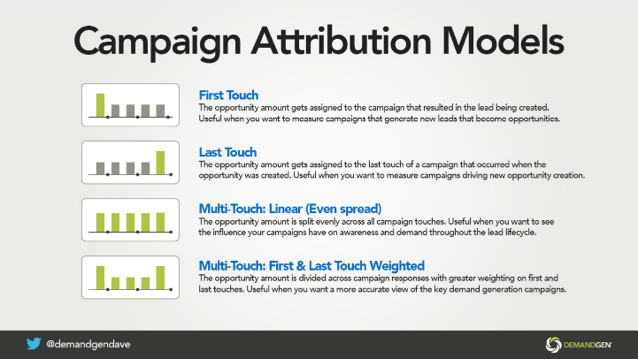 CAA does the attribution math for you, and the reports show you the revenue attributed for each campaign for each model type. Choose from flexible reporting solutions. 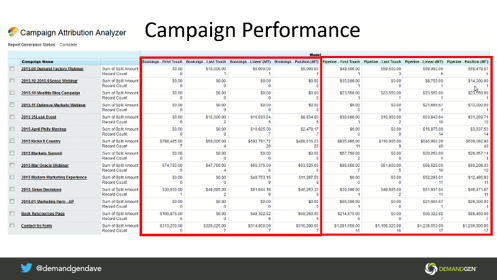 Part of the CAA solution includes a set of Salesforce reports through an entire campaign attribution table that is automatically generated. Some of our clients have us automatically export the campaign data nightly to our servers and we produce a “USA Today” type dashboard for them. Others stick with Salesforce reports. And some even use BI solutions for advanced analysis. No matter the output layer, the good news, is the data is complete and accurate. Finally! 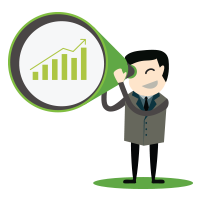 Adding DemandGen’s Campaign Attribution Analyzer (CAA) to your Demand Factory® finally gives you the ability to measure Marketing’s contribution to pipeline and revenue. Marketers need to talk about impact and results. At last, it’s possible to rebrand the marketing department from a cost center to a revenue center, easing budget constraints and giving you new power when seeking investment in programs. If you start now, by the end of this year you’ll have enough campaign attribution data to use for justifying next year’s budget. Interested? If you’d like to have us walk you through the system and answer your questions, just contact us. For the past decade, David and his team at DemandGen have been at the forefront of the transformation taking place in marketing by helping hundreds of the top sales and marketing teams around the world incorporate marketing automation to drive growth. David is accomplished industry speaker, thought leader, and author. His ground-breaking work on the transformation of marketing and sales is at the heart of his book, Manufacturing Demand: The Principles of Successful Lead Management.